On a clear day, a normal lollipop stick would suffice. In dark or dull conditions, the use of laser etching could be good for illuminated lollipop sticks. Image by Lewis Clarke, 2010 (Creative Commons License 2.0 – Attribution-ShareAlike). 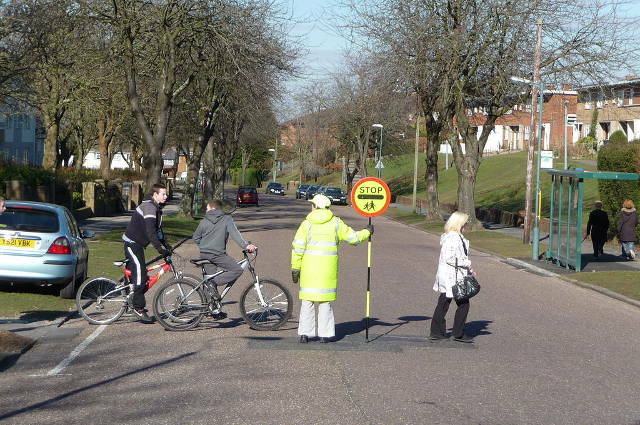 The lollipop lady or lollipop man is a stable of British life. They enable children to cross the road safely, to and from school. Over the last forty years, their uniform has changed, which makes them more visible to motorists. Over the same period, the lollipop signs they wield haven’t changed at all. That was till Andrew Turner found a solution to this problem. Laser etching has also made this possible. After seeing a near-miss with a lollipop patrol assistant in Darlington, Mr Turner saw a need for improvement. Without straying from present road signage standards, he has created a prototype stick with illuminated edges. His solution will improve the visibility of lollipop ladies and men. A boom in winter time when the nights are longer, or during overcast conditions. The prototype illuminated sign was manufactured with laser etching machines at Thorn Lighting’s Spennymoor plant. It has a battery life of eight hours. After testing his prototype with Durham County Council, drivers braked 40% faster than with conventional lollipop signs. Further trials are planned throughout the county. Andrew Turner, of Sedgefield, is looking for a distributor. We hope the wonders of laser etching and the trial’s encouraging results lead to its production. Able Engraving and Design, 08 February 2017. This entry was posted in Able News and tagged crossing patrols, engraving, laser etching, lollipop signs, road safety on 8th February 2017 by admin.